Weibo has grown as a company over the last 5 years, and the future looks bright for one of the leading social media platforms in China. Macro level outlook for Weibo is positive, and the company management is on a mission to monetize the user base better. Despite falling nearly 40% over the last 12 months, Weibo shares represent a good investment opportunity at the current market price. Despite clouds hanging over the Chinese economy, Weibo (NASDAQ:WB) will continue to grow in the next 10 years. Such growth prospects should translate to a higher stock price, but the opposite has happened over the last 12 months, and Weibo shares have declined significantly. Based on supportive macro level developments and the options considered by the management to monetize the user base aggressively in the next decade, I rate Weibo shares a buy at the current market price. Weibo is the largest social media platform in China, and since its inception in 2009, Weibo has gained traction among the young generation of China. Higher engagement strategies implemented by Weibo has earned them a loyal user base, and the number of monthly and daily active users have grown exponentially over the last 5 years. Along with this growth of active users, Weibo’s advertising revenues have continued to gain momentum, a secular trend that is expected to persist for the next 5 years. Weibo has focused on bringing more celebrities and influencers to the platform recently, a strategy that the company has been successful at implementing. The growing number of influencers (key opinion leaders) who are active on Weibo has boosted the appeal of advertisement solutions offered by Weibo, and on the other hand, prompted the younger generation of China to stay active on Weibo to follow influencers of their choice. The strategy focusing on influencers is working well for Weibo, and the company will continue to introduce more features to help these influencers grow their fan base on Weibo, which would result in a sticky user base. Even though Weibo was initially launched and marketed as an alternative to Twitter (NYSE:TWTR), the look and feel of the platform has certainly changed over the years. At present, users can share videos and even broadcast live video streams on Weibo, which goes well with the growth of video viewership around the world and the popularity of short video clips. Maintaining user engagement at very high levels is one of the primary business strategies of Weibo. To this end, the company is continuing to create appealing products for influencers and enters into partnerships with some of the biggest names in China to provide value-added services to its user base. For example, Weibo has partnered with Alibaba (NYSE:BABA) to direct its users across to e-commerce stores including Taobao. It’s an understatement to say that Weibo has had a very nice run in the last 5 years. 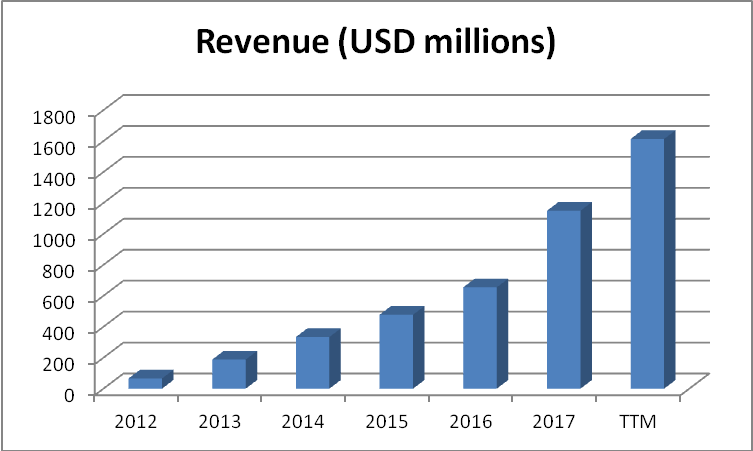 Since beginning to monetize the user base in 2012, Weibo’s revenues have grown at a CAGR of over 70%, which reminds of how Facebook (NASDAQ:FB) grew in the early stages. The stellar revenue growth is the result of higher monetization techniques used by Weibo and the growing active user base. In December 2018, Weibo had 462 million monthly active users, whereas daily active users breached the 200 million mark. 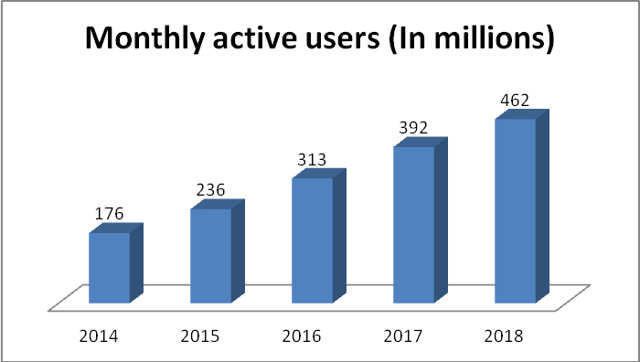 The growth in monthly active users has helped Weibo attract more advertisers to the platform, and the future of the company largely relies on how Weibo continues to attract more users to the platform, and how the company would be able to keep users engaged for a long period of time. As a social media platform, Weibo’s value to existing users increases as new users sign up for the platform and the number of users grow. Generally referred to as the network effect, this is one of the best sources of economic moats for a company. Weibo is certainly beginning to develop competitive advantages as the user base grows, and these competitive advantages would form the backdrop for the company to earn economic profits for an extended period of time. To build on its competitive advantages, Weibo is working with influencers to help them achieve success on the platform, which automatically incentivize such influencers to stay with Weibo to grow their fan base. To add some perspective, we can take a look at the number of influencers on Weibo with over 100,000 fans. 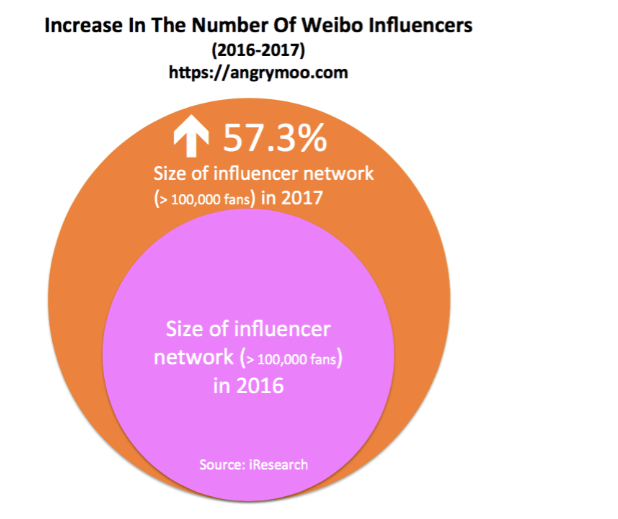 In 2017, the number of influencers on Weibo with over 100,000 followers grew by a staggering 57%, and such growth will improve the appeal of Weibo to influencers who do not use Weibo currently to monetize their fan base. Building a platform that is beneficial to both influencers and users is important to the success of Weibo. A higher user base will result in a higher follower base for influencers, which would result in higher earnings for such influencers as they monetize the follower base with third-party product promotions and advertisements. On the other hand, as the number of influencers on Weibo grows, users will benefit by being able to interact with such influencers and engage in more interesting topics. Weibo is on the right track, and following the footsteps of international giants including Facebook, Weibo should be able to grow its active user base over the next decade. 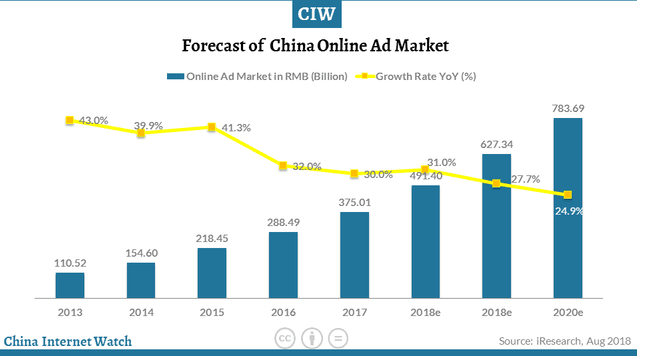 The online ad market in China is predicted to grow at double-digit rates through 2020, and I expect double-digit growth to extend even beyond 2020, supported by the shift to online advertising by companies on a global basis. As one of the leading social media platforms in China, Weibo stands to gain from this favorable macroeconomic outlook. Since introducing computer-based advertisements in 2012, Weibo has come a long way and now provides a plethora of advertising options to advertisers. Apart from advertising revenue, Weibo generates revenue from VIP memberships and game services. The expected growth of the active user base will result in higher value-added services revenue for Weibo as well. Weibo is by far the go-to platform for Chinese advertisers to target the young generation, and the growth of active users will attract many more advertisers to the platform. I expect advertising revenue to grow at double-digit rates for at least a decade to come. This will provide a boost to the profitability of the company, and the share price should follow suit. More than 462 million active monthly users make Weibo a much larger social media platform than Twitter, and Weibo’s focus on China makes it the platform of choice for international celebrities wanting to have a following in China. A number of celebrities have already signed up for Weibo accounts, and I expect this to become a trend as China is increasingly becoming one of the most important markets for celebrities from various industries. 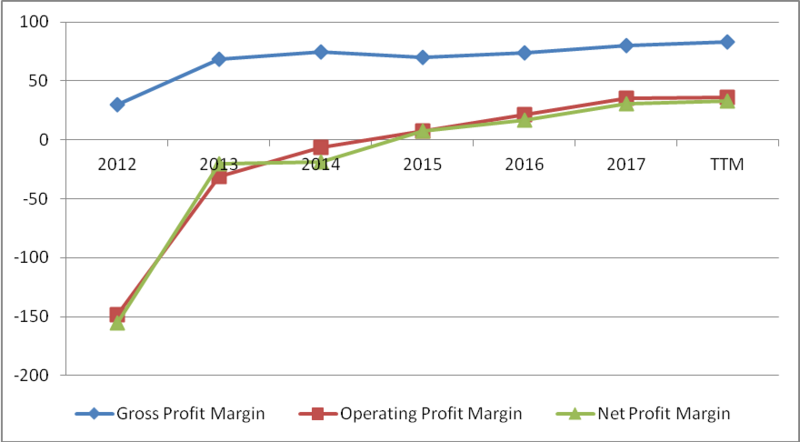 Revenue growth has resulted in higher profitability for the firm over the last 5 years, and profit margins have expanded. Since becoming a profitable company in 2014, Weibo’s margins have continued to expand, and I expect this to remain true for the best part of next 10 years as well. However, there might be a downward pressure on Weibo’s profit margins in the short term as competition for time spent on the internet increases. As competition increases, Weibo would be forced to spend more on advertising campaigns to stay on top of such competition, and this might result in lower operating leverage and a compression in profit margins. 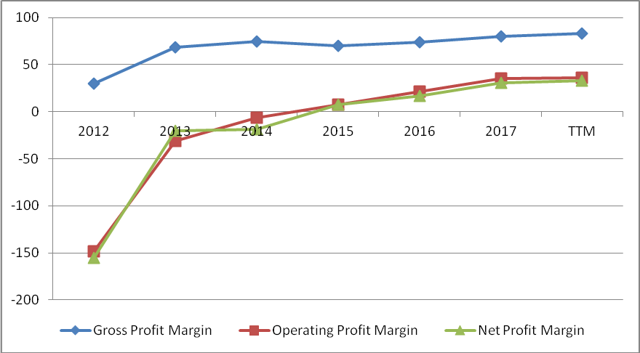 However, despite the possibility of a temporary contraction in operating margins, I expect profit margins to return to an expansionary phase once competitive advantages materialize over the long term. Even though the number of monthly active users already represents around 25% of the Chinese population, I believe there is massive growth ahead for Weibo based on several reasons. Monthly active users will certainly grow, and the company will be able to charge better rates from advertisers as Weibo becomes the platform of choice for advertisers in China. In addition, the company can focus on various types of monetization methods to generate higher revenues from its user base. As the world shifts to social media-based advertising campaigns, Weibo would remain at the forefront in China, and this will ensure the company’s ability to earn excess returns over a long period of time. Weibo is trading at a forward P/E of close to 24, which is well below its historical average P/E. Considering the favorable macroeconomic outlook, and the expansion plans of the company, I expect revenues to grow over 20% for the next 5 years, and then linearly slowdown to a more sustainable rate of around 3% in 10 years from now. Even though Weibo is expected to grow at a stellar rate for the next 10 years, shares have declined 40% over the last 12 months, which provides a necessary margin of safety to invest in Weibo shares. The average consensus analyst estimate for Weibo is $73, and the high estimate stands at $84. Considering the massive growth that I expect in Weibo in 2019, and the improving outlook for Asia as the possibility of a trade deal looks very high between the U.S. and China, I expect Weibo shares to converge with the high end of the analyst estimate in 2019, which represents an upside of close to 20%. Growth investors with a focus on companies outside the U.S. should find Weibo a very attractive issue at the current market price. There are 3 primary risks of investing in Weibo. Competition in the social media industry in China could heat up along with new products by Tencent (OTCPK:TCEHY) and other leading social media platforms in China including WeChat. If competition continues to increase in the industry, Weibo might fail to attract advertisers to its platform, which would then result in a significant loss of revenue. Regulations remain an area of concern for Weibo as the Chinese government is monitoring the social media activities of residents closely to identify malpractices and any other form of adverse developments. Considering Weibo is one of the go-to social media platforms in the country, there is always the possibility of such practices being conducted on Weibo, which would attract the attention of regulators to Weibo. If the Chinese economy fails to grow in the next 10 years, Chinese markets might enter a bear period. In this case, even if Weibo continues to grow, investors would fail to realize the expected rate of return on their investments and Weibo might remain undervalued for an extended period of time before beginning to converge with the intrinsic value. Weibo is one of the leading social media platforms in China, and the company is expected to grow exponentially, driven by favorable macroeconomic outlook and the possibility of higher monetization of its user base. The recent decline in share price presents growth investors with a good opportunity to invest in Weibo to earn a double-digit return in 2019. Additional disclosure: I might open a long position on Weibo within the next 5 days.